What’s good? Sometimes, when a product just works, you don’t give it a second thought and this Harris prong-type paddock stand is one of those. I’m the second owner of this one, as it came complete with a bike I bought, so I’m not entirely sure how old it is. But the welds, stainless steel tubing and free-rolling nylon wheels are all still as good as new and work faultlessly. The prongs are easily adjustable and secured via an allen bolt and keep the bike utterly stable. 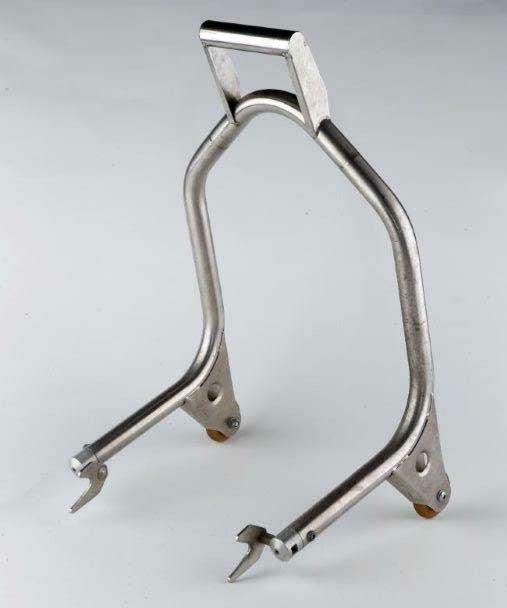 You will need some paddock stand bobbins if you want to use this type of stand, although Harris also make a universal cup-style stand for owners of bikes with conventional, square-edged swingarms. It’s lightweight, has oodles of utilitarian beauty and best of all it’s made using all the know-how from the legends at Harris Engineering. What’s not? Harris literally make hundreds of these stands every year, meaning they’re not exactly exclusive. So if you’re looking for a stand to appeal to your magpie sensibilities then this perhaps isn’t for you. But you’d be hard pushed to find a finer stand, especially at such a good price.